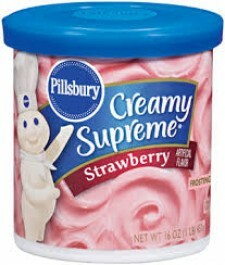 Maak je cake, koekje of brownie nog lekkerder met Pillsbury Creamy Supreme Strawberry Frosting. Het is makkelijk, lekker zacht en leuk! Sugar, Partially Hydrogenated Vegetable Oil (Soybean and Cottonseed Oil), Water, Corn Syrup, Corn Starch, Contains 2% Or Less of Each of The Following: Color Added Including Red 40, Salt, Mono- and Diglycerides, Modified Corn Starch, Artificial Flavor, Polysorbate 60, Potassium Sorbate (Preservative), Soy Lecithin, Citric Acid, Sodium Citrate. Contains Soybean Ingredients.